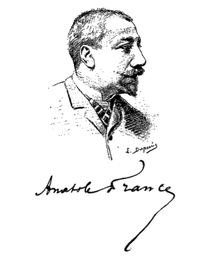 Anatole France (16 April 1844 – 12 October 1924), born Jacques Anatole François Thibault, was a French poet, journalist, and novelist. Ironic and skeptical, he was considered in his day the ideal French man of letters. A member of the Académie française, he won the 1921 Nobel Prize in Literature in recognition of his literary achievements. He is widely believed to be the model for the narrator's literary idol "Bergotte" in Marcel Proust's In Search of Lost Time. Il est sage de ne mettre ni crainte, ni espérance dans l’avenir incertain. Variant translation: Religion has done love a great service by making it a sin. Suffering — how divine it is, how misunderstood! We owe to it all that is good in us, all that gives value to life; we owe to it pity, we owe to it courage, we owe to it all the virtues. S’il fallait absolument choisir, j’aimerais mieux faire une chose immorale qu’une chose cruelle. Pour accomplir de grandes choses il ne suffit pas d'agir, il faut rêver; il ne suffit pas de calculer, il faut croire. Discours de réception, Séance De L'académie Française (introductory speech at a session of the French Academy), 24th December 1896, on Ferdinand de Lesseps' work on the Suez Canal. II n'y a que les pauvres gens qui payent comptant. Ce n'est pas par vertu; c'est parce qu'on ne leur fait pas crédit. L'ignorance et l'erreur sont nécessaires à la vie comme le pain et l'eau. Dans tout État policé, la richesse est chose sacrée; dans les démocraties elle est la seule chose sacrée. Nous avons des remèdes pour faire parler les femmes; nous n'en avons pas pour les faire taire. We have medicines to make women speak; we have none to make them keep silence. He had no knowledge and had no desire to acquire any; wherein he conformed to his genius whose engaging fragility he forbore to overload; his instinct fortunately telling him that it was better to understand little than to misunderstand a lot. Un conte sans amour est comme du boudin sans moutarde; c’est chose insipide. Il est à peu près impossible de constituer systématiquement une morale naturelle. La nature n'a pas de principes. Elle ne nous fournit aucune raison de croire que la vie humaine est respectable. La nature, indifférente, ne fait nulle distinction du bien et du mal. It is almost impossible systematically to constitute a natural moral law. Nature has no principles. She furnishes us with no reason to believe that human life is to be respected. Nature, in her indifference, makes no distinction between good and evil. De toutes les définitions de l'homme, la plus mauvaise me paraît celle qui en fait un animal raisonnable. Quand une chose a été dite et bien dite, n'ayez aucun scrupule, prenez-la, copiez. On devient bon écrivain comme on devient bon menuisier: en rabotant ses phrases. Variant translation: You become a good writer just as you become a good carpenter: by planing down your sentences. Also misattributed to Bertrand Russell, by Laurence J. Peter, in The Peter Prescription : How To Make Things Go Right (1976), but he subsequently attributed to France in Peter's Quotations: Ideas for Our Time (1977). Derived variant: If forty million people say a foolish thing it does not become a wise one, but the wise man is foolish to give them the lie. A people under the menace of war and of invasion is very easy to govern. It does not claim social reforms, it does not cavil over armaments or military equipment. It pays without haggling, it ruins itself at it, and that is excellent for the syndicates, the financiers, and the heads of industry to whom patriotic terrors open an abundant source of gain. Translated for "The New Age" by Leonard J. Simons (1914-01-22). Anatole France on Education. Speech at the Inauguration of the Education Part of the Socialist "Maison de Peuple," at Brussels. 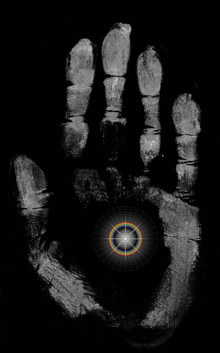 The New Age (Volume 14, Number 12) 363. Modernist Journals Project. Retrieved on 2017-01-04. All the historical books which contain no lies are extremely tedious. Variant: History books that contain no lies are extremely dull. Les amants qui aiment bien n'écrivent pas leur bonheur. Those who have given themselves the most concern about the happiness of peoples have made their neighbors very miserable. Variant: I prefer the errors of enthusiasm to the wisdom of indifference. Les gens qui n'eurent point de faiblesses sont terribles; on n'a point de prise sur eux. C'est d'actes et non d'idées que vivent les peuples. Variant: It is by acts and not by ideas that people live. We reproach people for talking about themselves but it is the subject they treat best. Les plus beaux mots du monde ne sont que de vains sons, si on ne les comprend pas. Il est bon que le cœur soit naïf et que l’esprit ne le soit pas. The good critic is one who tells of his mind's adventures among masterpieces. L'ironie, c'est la gaieté de la réflexion et la joie de la sagesse. The gods conform scrupulously to the sentiments of their worshippers: they have reasons for so doing. The Emperor Julian's morals were almost those of St. Gregory Nazianzen. There is nothing in this but what is natural and usual. And to me it seems that you have fallen asleep upon a white rock, and in a parish of dreams, and have dreamt all this in a moment while it was night. The gods conform scrupulously to the sentiments of their worshippers: they have reasons for so doing. Pay attention to this. The spirit which favoured the accession in Rome of the god of Israel was not merely the spirit of the masses, but also that of the philosophers. At that time, they were nearly all Stoics, and believed in one god alone, one on whose behalf Plato had laboured and one unconnected by tie of family or friendship with the gods of human form of Greece and Rome. This god, through his infinity, resembled the god of the Jews. Seneca and Epictetus, who venerated him, would have been the first to have been surprised at the resemblance, had they been called upon to institute a comparison. Nevertheless, they had themselves greatly contributed towards rendering acceptable the austere monotheism of the Judaeo-Christians. Doubtless a wide gulf separated Stoic haughtiness from Christian humility, but Seneca's morals, consequent upon his sadness and his contempt of nature, were paving the way for the Evangelical morals. The Stoics had joined issue with life and the beautiful; this rupture, attributed to Christianity, was initiated by the philosophers. A couple of centuries later, in the time of Constantine, both pagans and Christians will have, so to speak, the same morals and philosophy. The Emperor Julian, who restored to the Empire its old religion, which had been abolished by Constantine the Apostate, is justly regarded as an opponent of the Galilean. And, when perusing the petty treatises of Julian, one is struck with the number of ideas this enemy of the Christians held in common with them. He, like them, is a monotheist; with them, he believes in the merits of abstinence, fasting, and mortification of the flesh; with them, he despises carnal pleasures, and considers he will rise in favour with the gods by avoiding women; finally, he pushes Christian sentiment to the degree of rejoicing over his dirty beard and his black finger-nails. The Emperor Julian's morals were almost those of St. Gregory Nazianzen. There is nothing in this but what is natural and usual. The transformations undergone by morals and ideas are never sudden. The greatest changes in social life are wrought imperceptibly, and are only seen from afar. Christianity did not secure a foothold until such time as the condition of morals accommodated itself to it, and as Christianity itself had become adjusted to the condition of morals. It was unable to substitute itself for paganism until such time as paganism came to resemble it, and itself came to resemble paganism. The great human asset is man himself. In order to rate the terrestrial globe, it is necessary to begin by rating men. To exploit the soil, the mines, the waters, all the substances and all the forces of our planet, it needs man, the whole of man; humanity, the whole of humanity. The complete exploitation of the terrestrial globe demands the united labour of white, yellow, and black men. By reducing, diminishing, and weakening, or, to sum it up in one word, by colonising a portion of humanity, we are working against ourselves. It is to our advantage that yellow and black men should be powerful, free, and wealthy. Our prosperity and our wealth depend on theirs. The more is produced, the more will there be consumed. The greater the profit they derive from us, the greater the profit we shall derive from them. If they reap the benefit of our labours, so shall we fully reap theirs. If we study the movements which govern the destinies of societies, we may perhaps discover signs that the era of violent deeds is coming to an end. War, which was formerly a standing institution among nations, is now intermittent, and the periods of peace have become of longer duration than those of war. You seem to have dreamt on the white stone, in the midst of the people of dreams, since you dreamt so long a dream in the course of so short a night. "It is not likely," remarked Joséphin Leclerc, "that the future will be such as you have seen it. I do not wish for the coming of socialism, but I dread it not. Collectivism at the helm would be quite another thing than is imagined. Who was it who said, carrying back his thoughts to the time of Constantine and of the Church's early triumphs : 'Christianity is triumphant, but its triumph is subject to the conditions imposed by life on all political and religious parties. All of them, whatever they may be, undergo so complete a transformation in the struggle that after victory there remains of themselves but the name and a few symbols of the last idea'?" "Upon the whole, humanity changes little. What has been shall be." "No doubt," replied'Jean Boilly, " man, or that which we call man, changes little. We belong to a definite species. The evolution of the species is of necessity included in the definition of the species. It is impossible to conceive humanity subsequent to its transformation. A transformed species is a lost species. But what reason is there for us to believe that man is the end of the evolution of life upon the earth? Why suppose that his birth has exhausted the creative forces of nature, and that the universal mother of the flora and fauna should, after having shaped him, become for ever barren. A natural philosopher, who does not stand in fear of his own ideas, H. G. Wells, has said : 'Man is not final.' No indeed, man is neither the beginning nor the end of terrestrial life. Long before him, all over the globe, animated forces were multiplying in the depths of the sea, in the mud of the strand, in the forests, lakes, prairies, and tree-topped mountains. After him, new forms will go on taking shape. A future race, born perhaps of our own, but having perchance no bond of origin with us, will succeed us in the empire of the planet. These new spirits of the earth will ignore or despise us. The monuments of our arts, should they discover vestiges of them, will have no meaning for them. Rulers of the future, whose mind we can no more divine than the palaeopithekos of the Siwalik Mountains was able to forecast the trains of thought of Aristotle, Newton, and Poincaré." You worship this tree because it is beautiful. Therefore you are capable of feeling beauty. Now I come to reveal to you the hidden beauty. Thinking that what he saw were men living under the natural law, and that the Lord had sent him to teach them the Divine law, he preached the gospel to them. Just as the sun melts the ice of your mountains so Jesus Christ will melt the ice of your hearts. When the baptism of the penguins was known in Paradise, it caused neither joy nor sorrow, but an extreme surprise. It was high time for a generous benefactor to come to the relief of our necessities. Mael, a scion of a royal family of Cambria, was sent in his ninth year to the Abbey of Yvern so that he might there study both sacred and profane learning. At the age of fourteen he renounced his patrimony and took a vow to serve the Lord. His time was divided, according to the rule, between the singing of hymns, the study of grammar, and the meditation of eternal truths. A beautiful fig-tree raised itself in a hollow of the island and thrust forth its branches far and wide. The inhabitants of the island used to worship it. And the holy Mael said to them: "You worship this tree because it is beautiful. Therefore you are capable of feeling beauty. Now I come to reveal to you the hidden beauty." And he taught them the Gospel. And after having instructed them, he baptized them with salt and water. "Inhabitants of this island," said he, "although you be of small stature, you look less like a band of fishermen and mariners than like the senate of a judicious republic. By your gravity, your silence, your tranquil deportment, you form on this wild rock an assembly comparable to the Conscript Fathers at Rome deliberating in the temple of Victory, or rather, to the philosophers of Athens disputing on the benches of the Areopagus. Doubtless you possess neither their science nor their genius, but perhaps in the sight of God you are their superiors. I believe that you are simple and good. As I went round your island I saw no image of murder, no sign of carnage, no enemies' heads or scalps hung from a lofty pole or nailed to the doors of your villages. You appear to me to have no arts and not to work in metals. But your hearts are pure and your hands are innocent, and the truth will easily enter into your souls." Now what he had taken for men of small stature but of grave bearing were penguins whom the spring had gathered together, and who were ranged in couples on the natural steps of the rock, erect in the majesty of their large white bellies. From moment to moment they moved their winglets like arms, and uttered peaceful cries. They did not fear men, for they did not know them, and had never received any harm from them; and there was in the monk a certain gentleness that reassured the most timid animals and that pleased these penguins extremely. Touched by their attention, the holy man taught them the Gospel. "Inhabitants of this island, the earthly day that has just risen over your rocks is the image of the heavenly day that rises in your souls. For I bring you the inner light; I bring you the light and heat of the soul. Just as the sun melts the ice of your mountains so Jesus Christ will melt the ice of your hearts." Thus the old man spoke. As everywhere throughout nature voice calls to voice, as all which breathes in the light of day loves alternate strains, these penguins answered the old man by the sounds of their throats. And their voices were soft, for it was the season of their loves. The holy man, persuaded that they belonged to some idolatrous people and that in their own language they gave adherence to the Christian faith, invited them to receive baptism. "I think," said he to them, "that you bathe often, for all the hollows of the rocks are full of pure water, and as I came to your assembly I saw several of you plunging into these natural baths. Now purity of body is the image of spiritual purity." And he taught them the origin, the nature, and the effects of baptism. "Baptism," said he to them, "is Adoption, New Birth, Regeneration, Illumination." And he explained each of these points to them in succession. Then, having previously blessed the water that fell from the cascades and recited the exorcisms, he baptized those whom he had just taught, pouring on each of their heads a drop of pure water and pronouncing the sacred words. And thus for three days and three nights he baptized the birds. When the baptism of the penguins was known in Paradise, it caused neither joy nor sorrow, but an extreme surprise. The Lord himself was embarrassed. He gathered an assembly of clerics and doctors, and asked them whether they regarded the baptism as valid. Jealousy is a virtue of democracies which preserves them from tyrants. For the moment the peril was nowhere and yet everywhere. The majority remained solid; but the leaders became stiff and exacting. A pretext presented itself; some insult needed to be avenged, or some debt to be collected. Six battleships, fourteen cruisers, and eighteen transports sailed up the mouth of the river Hippopotamus. Six hundred canoes vainly opposed the landing of the troops. Admiral Vivier des Murenes' cannons produced an appalling effect upon the blacks, who replied to them with flights of arrows, but in spite of their fanatical courage they were entirely defeated. Popular enthusiasm was kindled by the newspapers which the financiers subsidised, and burst into a blaze. Some Socialists alone protested against this barbarous, doubtful, and dangerous enterprise. They were at once arrested. It was high time for a generous benefactor to come to the relief of our necessities. Rich and poor, learned and ignorant are turning away from us. And when we try to lead back these misguided souls, neither threats nor promises, neither gentleness nor violence, nor anything else is now successful. The Penguin clergy pine in desolation; our country priests, reduced to following the humblest of trades, are shoeless, and compelled to live upon such scraps as they can pick up. In our ruined churches the rain of heaven falls upon the faithful, and during the holy offices they can hear the noise of stones falling from the arches. The tower of the cathedral is tottering and will soon fall. St. Orberosia is forgotten by the Penguins, her devotion abandoned, and her sanctuary deserted. On her shrine, bereft of its gold and precious stones, the spider silently weaves her web. Penguinia gloried in its wealth. Those who produced the things necessary for life, wanted them; those who did not produce them had more than enough. "But these," as a member of the Institute said, "are necessary economic fatalities." The great Penguin people had no longer either traditions, intellectual culture, or arts. The progress of civilisation manifested itself among them by murderous industry, infamous speculation, and hideous luxury. Its capital assumed, as did all the great cities of the time, a cosmopolitan and financial character. An immense and regular ugliness reigned within it. The country enjoyed perfect tranquillity. It had reached its zenith. Drink! The flies have not spoilt my vintage; the vines were dry before they came. Your army awaits you. Come, lead it on to victory. The sun is about to descend into the roseate waters of the Sacred River. When you have eaten, you will slumber pleasantly in this garden, where the joys of the intellect and of the senses have reigned since the day when I drove hence the spirit of the old Demiurge. The archangel Michael took supreme command. He reassured their minds by his serenity. Archangel Michael, and you, Powers, Thrones, and Dominations, swear all of you to be faithful to your God. We have destroyed Ialdabaoth, our Tyrant, if in ourselves we have destroyed Ignorance and Fear. … Nectaire, you fought with me before the birth of the world. We were conquered because we failed to understand that Victory is a Spirit, and that it is in ourselves and in ourselves alone that we must attack and destroy Ialdabaoth. For the majority of people, though they do not know what to do with this life, long for another that shall have no end. Zita told him of the black standards assembled in crowds in all the waste places of the globe; of the deliverance premeditated and prepared in the provinces of Heaven, where the first revolt had long ago been fomented. "Prince," she went on, "your army awaits you. Come, lead it on to victory. ""Friends," replied the great archangel, "I was aware of the object of your visit. Baskets of fruit and honeycombs await you under the shade of this mighty tree. The sun is about to descend into the roseate waters of the Sacred River. When you have eaten, you will slumber pleasantly in this garden, where the joys of the intellect and of the senses have reigned since the day when I drove hence the spirit of the old Demiurge. To-morrow I will give you my answer." "The irreconcilable foe is rising once again. Let us take heed to ourselves, and in this, our time of danger, look to our defences, lest we lose our high abode." "We shall triumph under the sign that gave Constantine the victory." The archangel Michael took supreme command. He reassured their minds by his serenity. His countenance, wherein his soul was visible, expressed contempt for danger. By his orders, the chiefs of the thunderbolts, the Kerûbs, grown dull with the long interval of peace, paced with heavy steps the ramparts of the Holy Mountain, and, letting the gaze of their bovine eyes wander over the glittering clouds of their Lord, strove to place the divine batteries in position. After inspecting the defences, they swore to the Most High that all was in readiness. They took counsel together as to the plan they should follow. Michael was for the offensive. He, as a consummate soldier, said it was the supreme law. Attack, or be attacked, — there was no middle course. "Moreover," he added, "the offensive attitude is particularly suitable to the ardour of the Thrones and Dominations." Beyond that, it was impossible to obtain a word from the valiant chief, and this silence seemed the mark of a genius sure of himself. Mutterings and murmurs, mingling with the rumours of glory, gave rise to fears of an indecisive battle, a precipitate retreat. Insolent voices gave out that a spirit of the lowest category, a guardian angel, the insignificant Arcade, had checked and routed the dazzling host of the three great archangels. The garrison laid down their arms before Satan. Michael placed his flaming sword at the feet of the conquering archangel. "Archangel Michael, and you, Powers, Thrones, and Dominations, swear all of you to be faithful to your God." "We swear it," they replied with one voice. "Powers, Thrones, and Dominations, of all past wars, I wish but to remember the invincible courage that you displayed and the loyalty which you rendered to authority, for these assure me of the steadfastness of the fealty you have just sworn to me." The following day, on the ethereal plain, Satan commanded the black standards to be distributed to the troops, and the winged soldiers covered them with kisses and bedewed them with tears. And Satan had himself crowned God. Thronging round the glittering walls of Heavenly Jerusalem, apostles, pontiffs, virgins, martyrs, confessors, the whole company of the elect, who during the fierce battle had enjoyed delightful tranquillity, tasted infinite joy in the spectacle of the coronation. The elect saw with ravishment the Most High precipitated into Hell, and Satan seated on the throne of the Lord. In conformity with the will of God which had cut them off from sorrow they sang in the ancient fashion the praises of their new Master. "To thee I entrust my Spouse. Watch over her faithfully. In thee I confirm the right and power to decide matters of doctrine, to regulate the use of the sacraments, to make laws and to uphold purity of morals. And the faithful shall be under obligation to conform thereto. My Church is eternal, and the gates of hell shall not prevail against it. Thou art infallible. Nothing is changed." "O Lord, my God, I recognise Thy voice! Thy breath has been wafted like balm to my heart. Blessed be Thy name. Thy will be done on Earth, as it is in Heaven. Lead us not into temptation, but deliver us from evil." Satan found pleasure in praise and in the exercise of his grace; he loved to hear his wisdom and his power belauded. He listened with joy to the canticles of the cherubim who celebrated his good deeds, and he took no pleasure in listening to Nectaire's flute, because it celebrated nature's self, yielded to the insect and to the blade of grass their share of power and love, and counselled happiness and freedom. Satan, whose flesh had crept, in days gone by, at the idea that suffering prevailed in the world, now felt himself inaccessible to pity. He regarded suffering and death as the happy results of omnipotence and sovereign kindness. And the savour of the blood of victims rose upward towards him like sweet incense. He fell to condemning intelligence and to hating curiosity. He himself refused to learn anything more, for fear that in acquiring fresh knowledge he might let it be seen that he had not known everything at the very outset. He took pleasure in mystery, and believing that he would seem less great by being understood, he affected to be unintelligible. Dense fumes of Theology filled his brain. One day, following the example of his predecessor, he conceived the notion of proclaiming himself one god in three persons. Seeing Arcade smile as this proclamation was made, he drove him from his presence. Istar and Zita had long since returned to earth. Thus centuries passed like seconds. Now, one day, from the altitude of his throne, he plunged his gaze into the depths of the pit and saw Ialdabaoth in the Gehenna where he himself had long lain enchained. Amid the ever lasting gloom Ialdabaoth still retained his lofty mien. Blackened and shattered, terrible and sublime, he glanced upwards at the palace of the King of Heaven with a look of proud disdain, then turned away his head. And the new god, as he looked upon his foe, beheld the light of intelligence and love pass across his sorrow-stricken countenance. And lo! Ialdabaoth was now contemplating the Earth and, seeing it sunk in wickedness and suffering, he began to foster thoughts of kindliness in his heart. On a sudden he rose up, and beating the ether with his mighty arms, as though with oars, he hastened thither to instruct and to console mankind. Already his vast shadow shed upon the unhappy planet a shade soft as a night of love. And Satan awoke bathed in an icy sweat. Nectaire, Istar, Arcade, and Zita were standing round him. The finches were singing. "Comrades," said the great archangel, "no — we will not conquer the heavens. Enough to have the power. War engenders war, and victory defeat. "God, conquered, will become Satan; Satan, conquering, will become God. May the fates spare me this terrible lot; I love the Hell which formed my genius. I love the Earth where I have done some good, if it be possible to do any good in this fearful world where beings live but by rapine. Now, thanks to us, the god of old is dispossessed of his terrestrial empire, and every thinking being on this globe disdains him or knows him not. But what matter that men should be no longer submissive to Ialdabaoth if the spirit of Ialdabaoth is still in them; if they, like him, are jealous, violent, quarrelsome, and greedy, and the foes of the arts and of beauty? What matter that they have rejected the ferocious Demiurge, if they do not hearken to the friendly demons who teach all truths; to Dionysus, Apollo, and the Muses? As to ourselves, celestial spirits, sublime demons, we have destroyed Ialdabaoth, our Tyrant, if in ourselves we have destroyed Ignorance and Fear." "Nectaire, you fought with me before the birth of the world. We were conquered because we failed to understand that Victory is a Spirit, and that it is in ourselves and in ourselves alone that we must attack and destroy Ialdabaoth." No government ought to be without censors; and where the press is free, none ever will. No government ought to be without censors: & where the press is free, no one ever will. De toutes les aberrations sexuelles, la plus singulière est peut-être encore la chasteté. Remy de Gourmont, La Physique de l'Amour: Essai sur l'Instinct Sexuel (1903), ch. 18: La question des aberrations . Variant: Of all sexual aberrations, perhaps the most curious is chastity. Silence is the wit of fools, and one of the virtues of the wise. Can any thing in this world be more foolish than to think that all this rare fabric of heaven and earth can come by chance, when all the skill of art is not able to make an oyster! Variant: What can be more foolish than to think that all this rare fabric of heaven and earth could come by chance, when all the skill of art is not able to make an oyster! Je ne sais point de plus grande finesse pour parvenir à aimer que d'aimer, comme on apprend à étudier en étudiant, à parler en parlant, à travailler en travaillant. Apparently an invention by Maurice Sachs; see discussion in Quotes about Proust. If by Realism we mean Truth, which alone gives value to any study of human nature, we have in Anatole France a very dainty realist: — if by Romanticism we understand that unconscious tendency of the artist to elevate truth itself beyond the range of the familiar, and into the emotional realm of aspiration, then Anatole France is at times a romantic. And, nevertheless, as a literary figure he stands alone; neither by his distinctly Parisian refinement of method, nor yet by any definite characteristic of style, can he be successfully attached to any special group of writers. 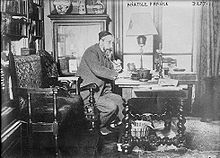 When Anatole France died, twenty years ago, his reputation suffered one of those sudden slumps to which highbrow writers who have lived long enough to become popular are especially liable. In France, according to the charming French custom, vicious personal attacks were made upon him while he lay dying and when he was freshly dead. 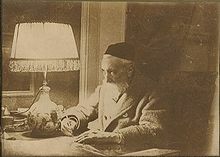 A particularly venomous one was written by Pierre Drieu la Rochelle, afterwards to become a collaborator of the Nazis. In England, also, it was discovered that Anatole France was no good. 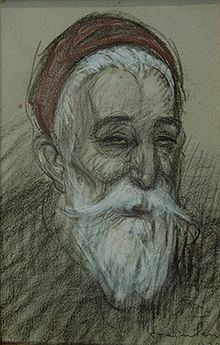 A few years later than this a young man attached to a weekly paper (I met him afterwards in Paris and found that he could not buy a tram ticket without assistance) solemnly assured me that Anatole France ‘wrote very bad French’. France was, it seemed, a vulgar, spurious and derivative writer whom everyone could now ‘see through’. Round about the same time, similar discoveries were being made about Bernard Shaw and Lytton Strachey: but curiously enough all three writers have remained very readable, while most of their detractors are forgotten. How far the revulsion against Anatole France was genuinely literary I do not know. Certainly he had been overpraised, and one must at times get tired of a writer so mannered and so indefatigably pornographic. But it is unquestionable that he was attacked partly from political motives. He may or may not have been a great writer, but he was one of the symbolic figures in the politico-literary dogfight which has been raging for a hundred years or more. The clericals and reactionaries hated him in just the same way as they hated Zola. Anatole France had championed Dreyfus, which needed considerable courage, he had debunked Joan of Arc, he had written a comic history of France; above all, he had lost no opportunity of poking fun at the Church. He was everything that the clericals and revanchistes, the people who first preached that the Boche must never be allowed to recover and afterwards sucked the blacking off Hitler’s boots, most detested. … He was willing to work for Socialism, even to deliver lectures on it in draughty halls, and he knew that it was both necessary and inevitable, but it is doubtful whether he subjectively wanted it. The world, he once said, would get about as much relief from the coming of Socialism as a sick man gets from turning over in bed. In a crisis he was ready to identify himself with the working class, but the thought of a Utopian future depressed him, as can be seen from his book, La Pierre Blanche. … Temperamentally he was not a Socialist but a Radical. At this date that is probably the rarer animal of the two, and it is his Radicalism, his passion for liberty and intellectual honesty, that give their special colour to the four novels about Monsieur Bergeret. This page was last edited on 21 January 2019, at 12:04.